Ani.me shows are all provided by content partners, who distribute anime in the local regions. Anime content partners include other streaming service websites, local anime distribution companies, and Japanese content creators. Media Blasters owns the license for the anime we distribute in North America. Languages: English (Dubbed), English (Subbed – To add later). For more titles, you can visit the Media Blasters website. Some anime contents are simply embedded content using public embeds from providers such as Hulu, Netflix, or Crunchyroll. These shows use these website’s provided players, which show advertisements provided by these websites. Ani.me does not control the contents of these advertisements or contents. You too can legally embed these shows in your site by clicking “Embed” from their websites to get the embed iframe code. Nearly all Japanese anime contents is created in Japan by Japanese companies. Some anime is created by foreign companies, particularly Chinese companies. The anime creation process typically includes funding that is provided by the original content service – usually a TV Network in Japan or another country. These TV companies invest large amounts of funds into the anime content creation studio, and then they receive a share of the ownership of the final production. In such cases, these companies also typically own all the licensing rights for their country – such as Japan. 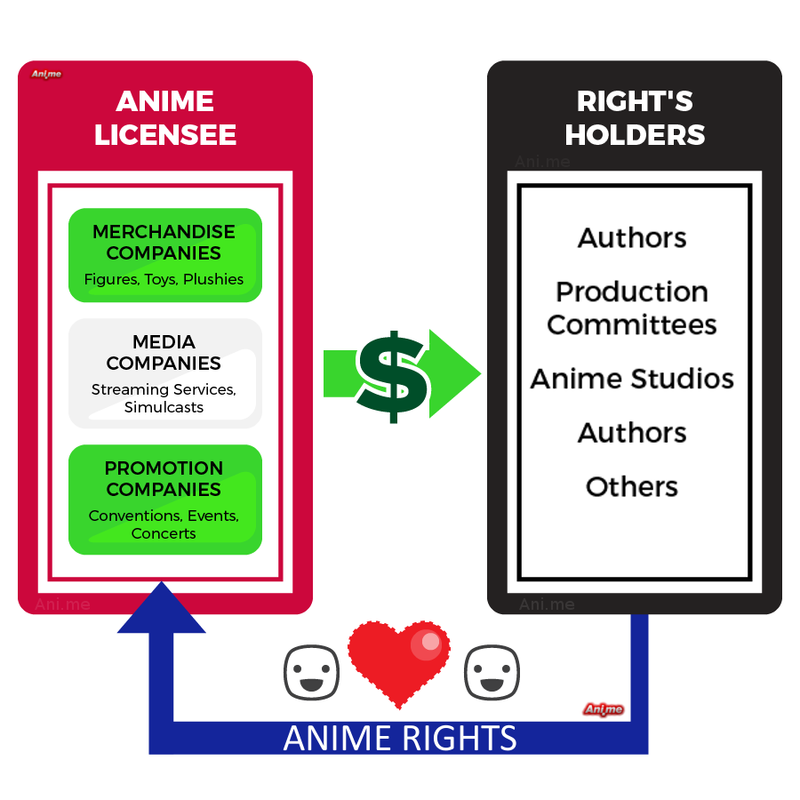 The rest of the content rights are controlled by a committee of all the investors in that particular anime. There may be as many as 30 investors. Whenever another country would like to show an anime show, they must contact this committee (usually by contacting the largest investor, often a TV station), and make an offer. Typically anime is licensed by distributors who then sell the anime in DVDs and elsewhere. Many companies have local licensing companies. Our website then works with these local distributing companies to stream anime, with the permission of the local licensee. Ani.me is a web platform dedicated to the promote of anime, music, conventions, and Japanese culture. Our goal is to unite anime fans on one convenient, easy-to-use, and 100% legal website. We have built a platform where anime fans can discuss their favorite anime, make new friends, and celebrate their friendships from conventions. Have you found an illegal website using Ani.me’s licensed anime? Click here to report suspected piracy.